Designed for MSOs offering SIP trunking, hosted voice, and high-speed data services, InnoMedia’s ESBC 8528-4B is a highly integrated and highly manageable Enterprise Session Border Controller (ESBC) that can be auto-provisioned and remotely managed. With InnoMedia’s exclusive Smart-DQoS™ technology enabling device-initiated DQoS UGS service flow establishment, ESBC 8528-4B is ideally suitable for MSOs offering bundled services with end-to-end quality of service over HFC cable plants. The built-in B2BUA and SIP ALG capabilities enable wide deployment by MSOs addressing SIP-PBX interoperability for SIP Trunking as well as providing simple NAT Traversal for Hosted PBX Services. Integrated with DOCSIS 2.0 embedded cable modem (eCM), embedded Session Boder Controller (eSBC), the Smart-DQoS™ technology, intelligent internal battery, and external UPS, InnoMedia ESBC 8528-4B offers 4 FXS ports, a path for the authorized/authenticated MSO SIP trunk traffic, a SIP ALG path for Hosted IP-PBX or IP Centrex Services, and a bridge/pass-through path for high speed data. Smart-DQoS™ enables ESBC8528-4B to intelligently initiate and manage DQoS Unsolicited Grant Service (UGS) service flows based on user and SIP signaling events, while directing non-real time data traffic to DOCSIS Best Effort (BE) service flows. It instantly enables MSOs to offer bundled services with end-to-end QoS without having to wait for PacketCable Multimedia based network infrastructure enhancement. The SIP trunk path provides SIP normalization, NAT traversal, topology hiding, and security for MSOs offering SIP trunking service to enterprise customers with diverse IPPBX and network configurations. It includes B2BUA for SIP normalization, a Registrar for User Agent (UA) registration, TLS block for secured signaling, and NAT traversal for proper SDP address correction. The UA (e.g., IPPBX) registers to and communicates with the ESBC which terminates UA traffic and re-initiates normalized SIP packets to communicate with the MSOs’ network servers. Together with Smart-DQoS™, the MSO is able to offer QoS ensured SIP trunking service. The SIP ALG path enables MSOs to offer Hosted PBX Services with NAT traversal, TLS security for signaling, and header manipulation. It allows SIP packets of registered UAs (e.g., IP Phones) to traverse through to communicate with the network servers. The UAs register to the designated network servers, and point to the ESBC as the default gateway. Together with Smart-DQoS™, the MSO is able to offer QoS ensured hosted voice/IP Centrex service. The bridge path is a transparent pass-through port, allowing undisrupted high-speed data to go through. It is intended for MSOs to offer high-speed data services. The ESBC 8528-4B, located at the edge of the HFC access networks, can be managed by the MSO with secured HTTP-based auto-provisioning and SNMP-based remote management. 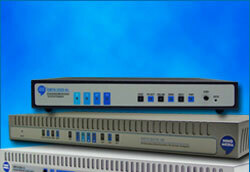 It offers an ideal demarcation between the MSO and its enterprise customers.